I have found myself in some very rich conversations here lately, so much so that it has caused lots of blog post ideas. One of the things that I have found myself sharing with others is this need to be intentional. The crazy thing is that this topic was a little bit of a sting for me. 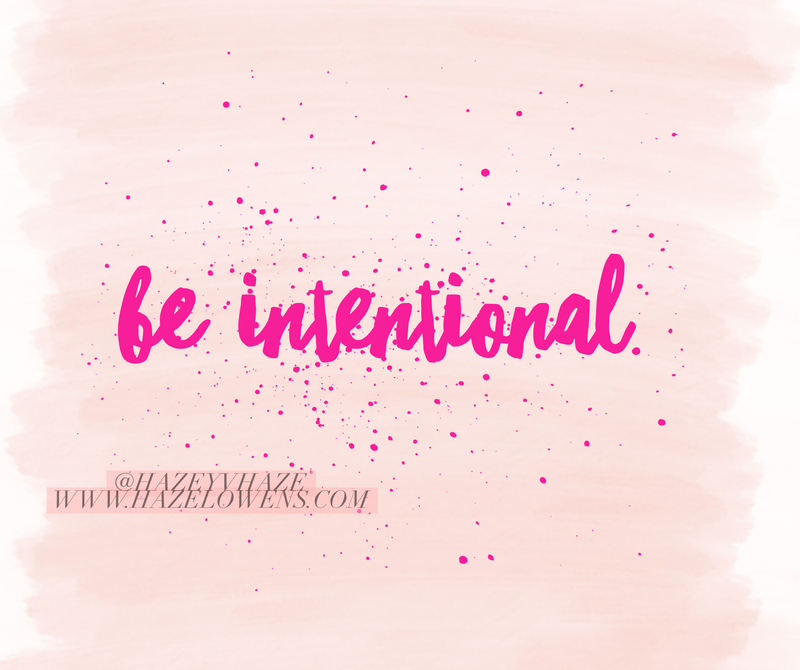 As I am pouring into several women about how we have to be more intentional about certain things we want to do or change, I could not help but to think about how the very words I was dishing out, I need to embrace for myself. Gosh it’s such a big word, packed with so much power. It requires focus, dedication, and purpose. It means doing something despite if we feel like it or not. It’s pushing past those emotions that makes us want to give in. It requires grit and a determined mind set. It’s not letting anything or anyone get in the way. It results in you being disciplined, goals being achieved, and self satisfication. It shows you that you can accomplish more than you think…that you’re more courageous than you let on. It shows that you have the power to do anything you set your mind to! What do you need to be more intentional about? It doesn’t matter how big or how small it is, there is something in our lives or about us that require intentionality…that thing that we will put off due to distractions. Examine yourself to discover what that is. If you’re like me, there may be multiple things that requires being more intentional. So here’s my challenge: Every Monday, starting today (I don’t know how long yet), I want us to find something that we can be more intentional about. We will comment on the weekly blog post (starting today) what that is, or take the picture in this post and share it on our social media pages including a caption of what we are being intentional about this week. Don’t forget to tag me on Instagram & Twitter @HazeyVHaze & using the hashtags: #BeIntentional #PerfectlyImperfectInc. Find an accountability partner that will push you every week to be more intentional! Let’s join in and help each other accomplish goals! This week: This week I will be more intentional about creating a schedule/task list for myself and stick to it, without beating myself up if something doesn’t get done. Oh and water…drink more water…I have really been tripping lately lol. Ever felt like the more you do, the less you get? Not that you do certain things with the expectation of getting something in return, but every once in a while it would be nice to see some positive results for the work or good deeds you’ve been doing. I don’t know about you, but there are times where I feel like I’m always getting the short end of the stick. Now do I believe this to be true? Not most often, but sometimes it feels that way. I read an article that talked about the life cycle of wheat. The article mentioned “winter wheat” which is used for baking bread/rolls. It goes on to state that this wheat is planted in the fall (October – December), and it grows over the winter months. The seeds do not harvest until Spring/early summer. The farmer has to wait a good 7-8 months after seed sowing before a harvest typically comes. Now I believe that pending weather conditions may make this process a little longer. Regardless, the farmer waits for the proper time of harvest before he receives any benefits of his seed sowing labor. 1. Don’t be discouraged in doing good. Continue to plant those seeds into good soil. Continue to love others as Christ would want you to. 2. Have confidence that the seeds you’ve been planting will reap a harvest! It will happen in the proper season. God knows when it’s harvest time for you. Be diligent like a farmer who waits for the proper season for his crops to harvest. He does his part by working the soil, sowing multiple seeds, watering the ground, and waiting for God to provide the increase. You may be a seed planter, provide the watering, or both but it’s God who supplies the harvest in the proper season. 3. Be patient waiting on the harvest. Your time will come, but if you give out too soon you’ll miss your harvest. Some of you may be on the cusp of your harvest season! Don’t get discouraged and give out! Harvest season is coming! Father, thank you for being so awesome and amazing! Thank you for your protection and the provisions that you give us daily. Thank you for the immeasurable amount of grace that you provide even though we are not deserving of it. Lord help us to continue to try to imitate our lives after you, to have a heart like you have, to see others the way you see them, and to love the way you love. Forgive us for times where we have become frustrated in our sowing of good deeds, for times where we have made things all about us, for times of frustration leading to actions outside of your will, and for moments of not trusting you the way we should. 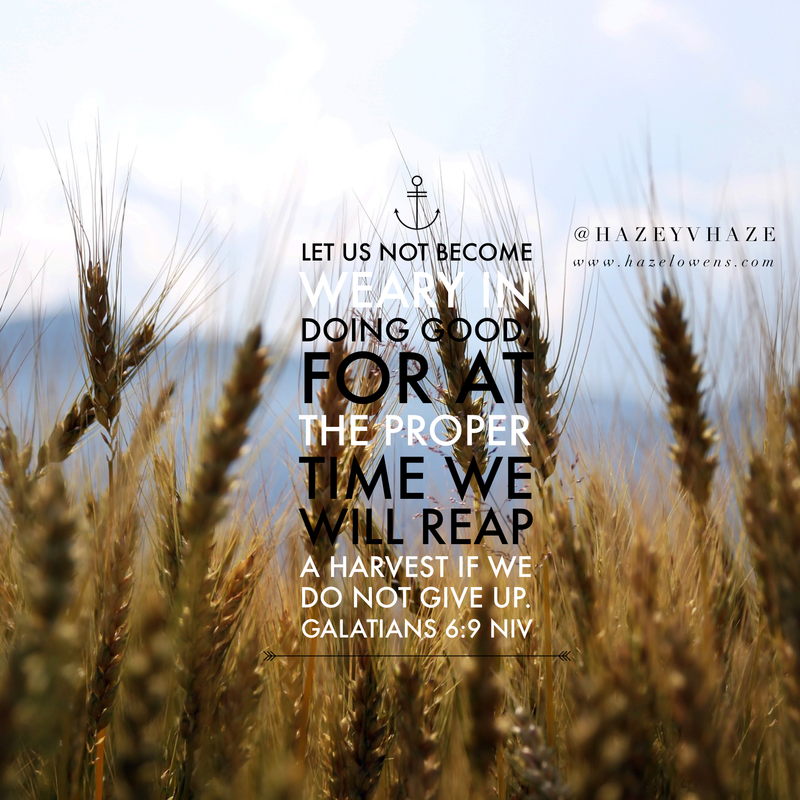 Help us to remember that our doing good/our good seed sowing is not in vain. Help us to endure the time waiting on our harvest to come. Give us the strength, patience, and comfort needed in times when our emotions get the best of us and we are wanting to give up. Restore our minds in those moments. The enemy has no authority over us for you have already given us the victory in Christ Jesus. As we wait for the harvest season in our lives, we are comforted that your timing of increase will be at the most perfect time. We are praising you in advance for what is already done and what’s to come from the seeds we’ve sowed. We will be sure to give your name all the glory, honor and praise! In Christ name we pray, Amen. So this morning has been a bit rough for me. I literally have been trying to pull it together all morning, and it seems like the more I try, the more I fell apart. Now, normally I’m a super positive, sunshine and rainbows, & “life is great” kinda gal! This morning was a bit different…I was feeling like I just ran into a ton of bricks. So at the risk of being extremely late for work (because I already was running late), I posted my video. Then I praised God for being so amazing to me. I said a prayer about my state of mind this morning, and declared that today would be awesome! Unfortunately, the enemy wouldn’t let up on me so easily. I began to have racing thoughts about a major decision I’m making, and other areas in my life that are not exactly how I would imagine. I then can feel anxiety come over me as my eyes filled more and more with tears after each passing thought through my head. I excused myself from my desk, went into the break room, and sat in the “relaxing chair”. I began to cry out to God! I started feeling silly because I’m concerned about things and people that at the end of the day doesn’t matter. I know what His promises are for me, and yet I sat crying and spewing over things that are unimportant. I needed to let it all out. So I called my sweet friend Brandee (y’all seriously check out her site) and told her I needed to vent. I just let it all out without trying to sound polite, graceful, gentle…I just said how I felt. She listened and then began to confirm things I already knew. One thing she said that stood out was: Don’t quit on your happiness! I wanted to fall out right there! Those words was like the jump I needed for my battery. At that point I dried my eyes, sat up straight, and lifted my head. Don’t QUIT on your happiness! Here’s the thing: Happiness is based off of things that are happening. What you want is joy! I have that through Jesus Christ. But every now and then, the enemy wants you to focus on what’s happening to get you to a place where you are less satisfied with life, thus running the risk of him stealing your joy! Life may not be where you want it, but don’t quit! Focus on the things and people that make you happy! The areas of your life that is still a bit of a struggle, don’t worry about it. Surrender those things to God and let Him give you joy! Focus on your happiness! Take a deep breath with me, look around at all the things that are happening that gives you positive vibes/that makes your soul smile, and take life one day at a time! All things are working for your good and mine! Don’t quit on your happiness! Remember this: Though you are imperfect, you are loved by a perfect God! As I sit down tonight, I look around me and a mix of emotions start to take over. On one hand, I’m so excited to sit and journal. This is one of my happy places . . . to let my thoughts spill all over lined paper using the color ink of my liking. Tonight, I chose the color “purple”; it’s so pretty on my pages 🙂 Anyway . . . Here I am beaming with excitement to have a moment to enter my happy place I take a looksee at what is around me. The cluttered nook, the ironing board and iron that’s not in its rightful place, the mound of seminary books (plus the new ones that invaded my space today), the “pile – o – shoes” that’s lurking by the door, the basket of towels reminding me of all the laundry needing done . . . all of these things started to rob me of my excitement, joy, and sense of relaxation knowing that I can sit down and journal. Instantly, I became annoyed and frustrated. Just as those negative emotions started to consume me, I fought back! I realized that deep down I’m starting to feel overwhelmed. At that moment, I created an atmosphere of what turned to be more like a messy “Starbucks” in my living room. I sat with my pen and journal, while the smooth melodies of Miles Davis, Duke Ellington, and John Coltrane play in the background. I sipped coffee from one of my favorite “small” coffee mugs lined with my favorite creamy, caramel sauce. With every sip of this bold, hot, caramel macchiato, “carmely” tasting coffee, I felt myself becoming more relaxed. During this moment, my feeling of overwhelmingness subsided. Find a “happy place” and allow yourself to get outside of yourself – This requires being intentional. What activity can you do that will allow you to relax and let your thoughts flow? For me it’s a calming atmosphere where I can journal. Maybe for some it’s working out, cooking, knitting, coloring, going for a drive, walking, or maybe just sitting still. Whatever it is, find it and get outside of yourself. Be intentional about taking some “me” time. Ask yourself: What’s most important at this time? – When you are outside of yourself you can take an inventory of self. Evaluate what are the most important things in this day/in this moment, that need to be done right away. Allow yourself to rank and prioritize your tasks. Take a deep breath and EXCUSE yourself! – Listen, what I am learning is that I am one person. I cannot do everything and be everywhere at the same time. So I have to excuse myself from time to time. I am not Superwoman. You are not Superwoman. SUPERWOMAN does not exist! You are not going to get everything done and please everyone all the time. Guess what?? It’s okay! Quit putting unnecessary expectations on yourself to be all and do all. This kind of pressure produces anxiety, doubt, fear . . . all ingredients to make for an everlasting sense of feeling overwhelmed. Stop operating in your own power – Ask God how He wants you to manage your day. This should probably be #1. Often times when we are feeling overwhelmed, we are taking on way more than we should or could handle. At least this is the case for me. Ask God: What does He wants you to take on? Does what you’re doing/managing align to God’s will for your life? Is this a God appointed task or “busy work”? Have you asked Him permission before taking on that task? Is this something He wants you to focus on right now? Often times we can easily get caught up in the busyness of our day-to-day, and become these “yes” people to every good, “bright” idea. Because we didn’t seek God first in making that decision, we become wore out from the busyness. And if He indeed called you to everything that’s on your plate, are you allowing Him to help you with everything. How much time are you spending with Him? God is always with you, but sometimes we tend to push Him out. Invite God into your day! Let His power give you the ability to handle all that you need to do. His strength is made perfect in your weakness (2 Corinthians 12:9). Lastly, Think Positive – Change your attitude about your assignments for the day. If you were able to accomplish 2 out of 5 things on your list of “to do’s”, then job well done! Pat yourself on the back, and know that tomorrow is a new day. Take it one day at a time. Start and end your day with positivity! Lord, thank you for your immeasurable amount of grace you extend to us daily. Help us to not adapt the personality of Superwoman, but instead tap into your “Super” power. Please forgive us for times we have not invited you into our day or sought your approval on tasks. Help us when we feel overwhelmed; and remind us through you all things are possible. Lord help us to be women who organize our lives and our tasks based off of your will for our lives. We love you, we honor you, we give you all the glory and praise. In Jesus name, Amen. Remember this: Though you are imperfect, you are loved by a perfect God. You mad? The four P’s to Handling conflict! So just a couple weeks ago, I taught Sunday School at my church for ages 25-35. The topic was “Confrontation & Restoration”. Preparing this lesson was a huge blessing for me. It made me look at the ways I have at times handled conflict. This topic has continued to weigh on my heart. So much so that I was moved to broadcast live on Periscope “The Four P’s to Handling Conflict” (which was a piece of my lesson). Check out the link below and watch the broadcast. I believe it’s only available for 24hours. Follow me on Periscope: @HazeyVHaze for more live broadcasts!